Grind all ingredients together and make a fine powder. Take a large bowl and add Gram Flour & Black Gram Flour. Add Milk & 3 tbsp Clarified butter, mix well all ingredients. Gently press and strain the flour using sieve with big holes and keep it aside. Heat 5 tbsp Clarified Butter in a kadhai over medium flame. Fry Edible Gum and crush lightly, do not make a fine powder. Take another kadhai and heat 2 tbsp Clarified butter over low flame. Add Mawa, stir continuously and cook for 4 – 5 minutes. Now take a large kadhai and add remaining Clarified butter and heat. Add strained flour in it, stir continuously and cook for 10 – 12 minutes over low flame. 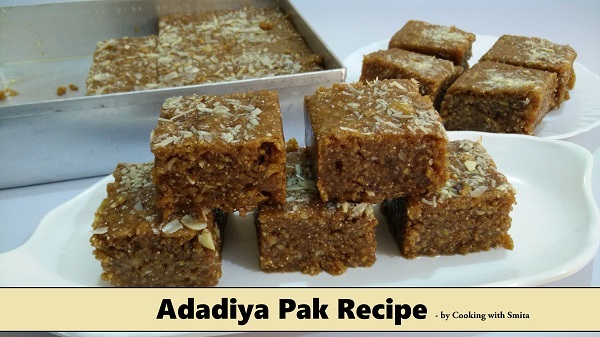 After 10 – 12 minutes switch off the gas and add all ingredients – cooked Mawa, fried Edible Gum, Poppy Seeds, mix dry fruits and Adadiya Pak Masala. In a medium saucepan add Sugar and water, stir and boil until sugar is completely dissolved and make Sugar Syrup of 1 & ½ thread consistency. Add Sugar syrup to the mixture and stir for 2 minutes. Grease the tin with clarified butter and add Adadiya Pak mixture and let it set for 2 – 3 hours. After 3 hours (when it is completely set) cut it into desired size pieces and serve. Store in air-tight container and consume within 2 – 3 weeks, you can store it in the refrigerator for 4 – 6 weeks.